When Rain grew 4 cute little teeth, I bought a finger silicon toothbrush so I can start introducing her to the "fun" task of tooth brushing Yay! Personal hygiene 101. And of course being a baby, she didn't care what it was. She actually liked it when I rubbed the silicon bristles gently against her teeth and gums with sterilized water. Fast forward to present time. Rain now has 4 more teeth plus 2 molars. And so I decided to ask her Pedia if it was okay to use baby toothpaste now. I got the go signal as long as I used a toothpaste for babies and just use a pea sized amount. So of course I was excited to buy her first actual toothbrush and toothpaste! So I bought these! 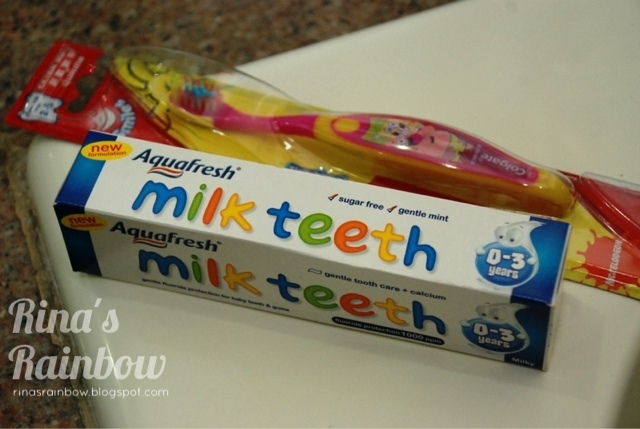 An Aquafresh infant toothpaste called Milk Teeth (for 0-3 years old), and a Colgate toothbrush which says it was for 2 -5 year old. They had nothing below 2 year old. But since Rain is more than a year old I figured it might be okay. So even if the doctor said it's okay to use a pea size of toothpaste, I went with my gut and only smeared a teeny tiny amount of toothpaste on her toothbrush (I literally just smeared the opening of the toothpaste on the bristles without squeezing the tube.) I started brushing her teeth but I only got to do 3 or 4 quick light strokes on her bottom teeth before the taste of the toothpaste kicked in and she realized she didn't like it. She shoved the brush away and started fidgeting and whining. Uh-oh. The toothbrush I got may have also been another factor. The texture was very new to her. Not like the silicon one she was used to. Sadly after this experience, she refuses to let me brush her teeth anymore. Even with the silicon brush. If only I could turn back time, I would have just stuck with the finger brush and water for now and maybe just a dot of toothpaste. So I sought advice from an expert. An experienced mother with 3 kids. She told me I needed to power through. In other words, hold her down and brush her teeth with or without her consent. Yes it sounds harsh but in the long run it will be a lot better for Rain rather than having very bad teeth at such an early age. Her 2 year old son almost got a root canal because turns out the yaya wouldn't brush the kid's teeth once he starts screaming. And I don't want it to come to that. So after that they forced to brush his teeth everyday. And after 2 months the kid became totally used to it and likes it too! I breathed a sigh of relief. There is still hope! So as soon as we came home, I changed Rain in her jammies. And then we braced ourselves for the task. 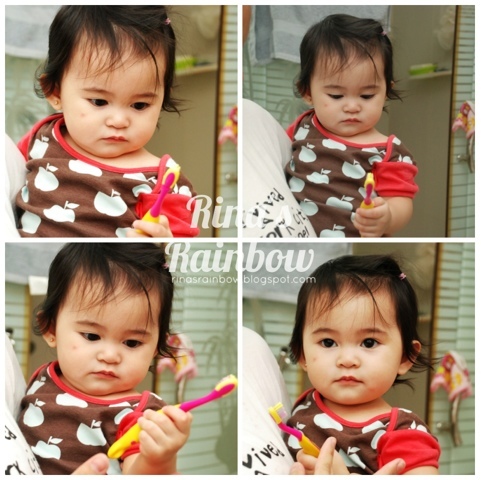 Richie supported her head, I held Rain's arms with my left hand, and held the finger brush on my right. She of course started crying which made it easier for me because her mouth was open. The toothbrush has landed! Success! When we were done, she stopped crying as if nothing happened. Hehehe. (Sorry sweetheart its for your own good!). We did it again the following day. 2 times a day with the finger toothbrush. Then again the third day with a few dots of toothpaste. 4th day I used the real toothbrush I bought with a few dots of toothpaste. All success! I'm so glad I was able to talk to my experienced mom friend. Nothing beats learning from real experiences! At least I can sleep better at night now knowing Rain has clean teeth every night before going to sleep. Oh yes.. sometimes even though it breaks our hearts we need to be as strong willed as them or even more. telaysky - That would definitely work for me!!! Nice post.i really like this blog.through this post i got something useful tip for baby teeth care.i want to read some more blog so please keep sharing. Awesome post. Thanks for sharing with us. I got some useful tips about baby teeth care. Thank you so much for sharing these great information's. A Rainbow Thought of the Day : Perfect Parent? New Attractions at Fun Ranch! Oh, and a GIVEAWAY!